Wednesday evening and I’m boarding a bus carrying a child sized Ernie doll. I get surprisingly few weird looks. I did try to stuff him in my bag but he didn’t fit. I’m not sure what’s a worse look… openly carrying around an orange limpy doll or a head emerging from a bag looking like he’s close to suffocation. I’m doing part of a university lecture tomorrow. I approached my colleague who who will be doing most of the lecture, carrying Ernie under my arm. ‘Is it ok, if I bring him?’ She of course said yes but gave me that strange look. It’s all a bit crazy really. I’m going to lecture a bunch of Speech Pathology Masters Students with a woman who has over 35 years of experience and a PhD and I have no qualification relevant to my working life and a stuffed toy. For the doll I must give credit to a former colleague. 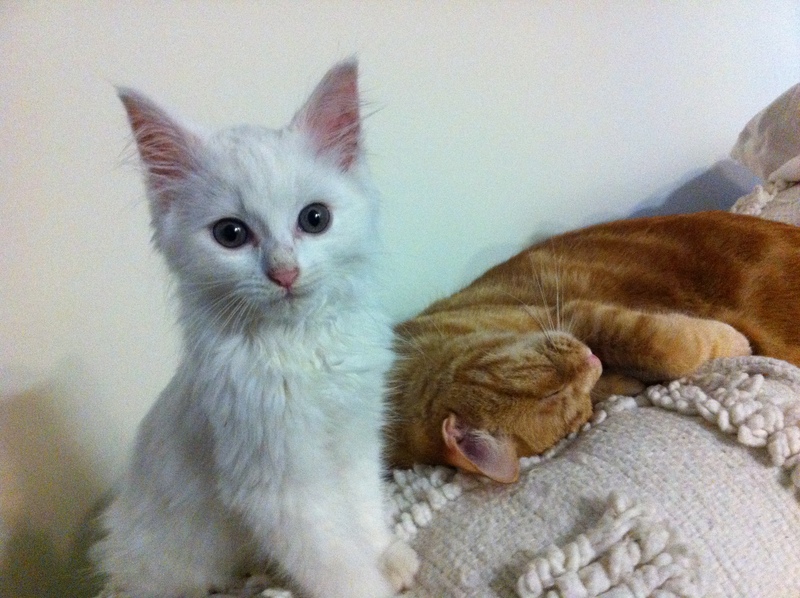 She gifted him to me when she left. ‘Use him for training’ she said. It’s all her fault. Of course staring at the back of his head on the way home I realised that Ernie has an issue. He doesn’t have a hearing aid or a Cochlear Implant. Unlike some of the other ‘props’ at work, Ernie is unaided. The bus turns the corner into Marrickville and I’m silently cursing my former colleague for Ernie’s poor device compliance. Maybe I can craft one up? Someone at work made a Baha (a type of hearing aid if you like), using an egg carton and some velcro. Then again… maybe not. 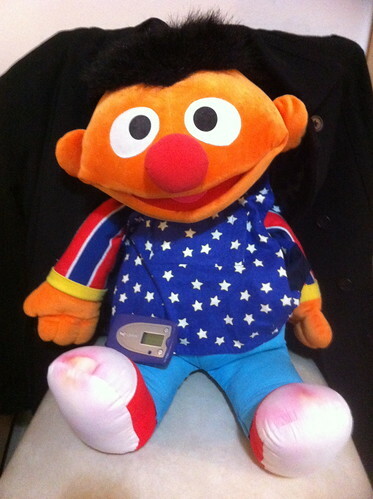 Tomorrow I’m going to talk about what I know about LENA devices (the thing in Ernie’s lap). This device I once heard described as a language pedometer. They can be used with children to capture a ‘language sample’ over the period of a day or so and then, once plugged in to some whizz bang software, have that language sample analysed to give indications of how much meaningful speech the child may have heard (speech that was loud enough and without significant background noise); how much distant speech, how much noise and how much electronic sound (such as TV). It tells you how many adult words were said and how many times there were conversations between Ernie and his carer. The technology still does my head in. It’s a tool which has the capacity to show parents of children who have a hearing loss that their child how many words each day their child is hearing and saying and how they – the parents – have the capacity to grow their child’s listening, language and speech by increasing how much they speak to their child during everyday activities and how much of that is in close proximity so the child can access the sound. It got me thinking about my childhood. The device counts ‘adult words’. I’m not sure how it does it – some mathmatical algorithm I expect. I wonder what it would have made of some of the books my mum and dad liked to read me. Books with words such as ‘scroobious pip’, ‘moppisikin floppsikin bears’, ‘pobbles’ and ‘jabberwockies’. No wonder as a grown up I do slightly offbeat presentations inclusive of ridiculous props. Let’s hope the uni students have a sense of humour. Wish me luck. Apparently there is a view out there in the stratosphere that charities are out to make people feel bad. Take this article from Geek Ergo Sum, where militant employees of charities prey upon unaware shoppers demanding they choose which is the more worthwhile cause. Contrary to this popular belief, in my experience many charities are trying to make people feel good… even inspired. Yet the negative perception of fundraising is no stranger to me. Whenever someone asks what I do and I explain that I am a data monkey for a not for profit and I help both fundraising and clinical, they are inevitably more interested in the clinical side. In fact, sometimes it’s like I never said the word fundraising. Some time ago I went to a talk where a very seasoned fundraiser got up and spoke about the fact that no one (or no one he knew) grew up saying ‘I want to be a fundraiser.’ He urged the audience to find some pride in the profession – being a fundraiser should not be a source of shame. For me, I had yet to even identify myself as a fundraiser – after all, fundraisers were those people who actually went out and asked for donations; not a data monkey like myself. Yet as the years have gone by, I have realised that it takes many skills and talents to form a fundraising team and I can no longer hide and say ‘I’m not a fundraiser.’ I am most certainly one. I have also realised that I am fortunate. The daily post this week asked bloggers to comment on the cause they would like to support (if they didn’t need to work). Nothing came to mind. Then I realised that’s because I don’t have to give up work to support a cause. I am one of a lucky few who don’t have to dream about it. I get to do it each and every day. And that’s pretty cool… I daresay even something of which I can be proud. I recently went to the A G Bell Listening and Language Symposium in Los Angeles to present a workshop: When Paper and Excel Aren’t Enough: Tracking Every Child’s Development. When I got back a member of the clinical team at work said to me: how do you write a data presentation that’s engaging? How do you come up with your ideas? How do you create something that will make them sit up and listen and not go to sleep? This got me thinking… how do you write an engaging data presentation – or any other type of presentation for that matter. Here’s my quick guide. I know, BORING but true. When I am the clearest about what I hope to convey, what I want the audience to gain from the presentation, I do the best job. Yes, data presentations can be creative. If what you have to present on is rather dry, then what a wonderful challenge to your creative side! My mantra is that data is only dull if it doesn’t tell you anything. Use your data to tell ‘stories’. I’ll give you an example. Some time ago I was working on a presentation about donors and fundraising income. I had a limited timeframe to try to paint a detailed picture of the Organisations supporters such that people could leave the presentation understanding what the opportunities and limitations of fundraising growth may be. I played around with various analogies before settling on ‘a rainforest’. I described how the donor database was made up of many individuals (trees) and depending on the types of trees, the overall ‘health’ of the forest changed over time. I discussed the old growth forest – those loyal supporters who over the years had increased their annual gifts. However just like a forest, new individuals have to be added to the forest for it to be healthy and certainly if it is to grow beyond its original borders. Whenever you plant a sapling, you will invariably lose some. And a new tree is never going to be as beneficial to the forest as a mature tree. It will take years for those saplings to stretch towards the canopy. By using an analogy, I was able to say many things I could not otherwise say. It would have been easy to say ‘yes, the database is bigger than it was as we have added X thousand new donors but you can’t expect to generate the income at the same rate from these new donors – your growth estimates are too high’… and it would have gone in one ear and out the other. By putting the scenario into an analogy, it makes it easier to discuss. (Some may say that to describe donors as ‘trees’ is to dehumanise them. I’d argue that describing your donor database as a precious rainforest is an appropriate representation of the many thousands and millions of people who generously support not for profit organisations. The planet can’t live without rainforest). Finding this ‘analogy’ or creative hook is not always easy. In preparing for the A G Bell Listening and Language Symposium, I spent a fair bit of time in the toy room… thinking. Before the final presentation (which uses children’s books as a theme), I had pulled out buses, Mr Potato Head and Pop-Up Pirates among other things. In the end, if you are clear on your objectives, your creative execution will come. Presentations I give today have far less words on the screen than I once used. I’ve noticed that after the first draft, my process is to remove words with each revision. In my last presentation, at one stage, I left a bunch of text on the screen in a font which was way too small to read to actually prove the point that it’s impossible to decipher quickly, if at all and then showed the visual graphic I had conceived in our database which replaced all that text. There is nothing more painful, than sitting through a presentation which is drowning in words and the presenter adds so little extra that you might as well just have downloaded the slides and saved yourself a whole heap of ‘listening’ time. I also agree with many articles which say, don’t read your presentation. It’s a guaranteed pathway to a yawning audience in my book. People connect with people. When I first started doing presentations, I think my content was such that someone else could have picked up my presentation and delivered something approximating what I had delivered. These days, my presentations are infused with a lot more of my personality. Prior to going to the Listening and Language Symposium, a now former colleague said to me ‘are you going to do one of your wacky presentations?’ (I prefer the term quirky to wacky for the record). I remember saying something like… I think I may need to be a little more serious that I usually am. If it comes natural to you – go with it. It will invariably be better. I’m a data monkey who is lucky enough to work with an amazing clinical team of Audiologists, Auditory-Verbal Therapists and Counsellors. I also get to work with some very talented and capable fundraisers. The point is there is not another data monkey among them. While a presentation of defined fields, absent of all ‘free text’ based information may excite me, it’s hardly going to get the Listening and Spoken Language Specialist humming with excitement. I told Mr West some time ago – ‘if you’re going to present to Clinical, take a toy.’ He was brand new at the time. He thought I was being flippant. He has since learned that I am deadly serious. 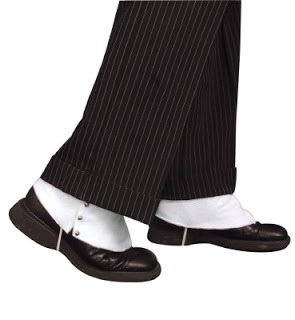 I’m thinking back on a presentation I saw many years ago where the presenter, had a habit of walking 2 steps to the left and 2 steps back to the right (and it wasn’t the timewarp dance). It drove me nuts. If someone is constantly straightening their clothing, it would equally annoy me. Or tossing from one foot to another because their shoes have given them blisters. Comfortable shoes and familiar clothes lead to confident presenters! Discussing fundraising through the use of a rainforest metaphor could have been a complete flop. Lucky for me, it wasn’t! I strongly believe that leaving some room for spontaneity in your presentation is a key to being engaging. An overly rehearsed and scripted presentation with little room for detour to suit the audience is safe. Yet this ‘structure’ can affect the tone of your presentation. There are very skilled presenters I am sure who can deliver the same presentation time and time again and have it almost word for word and still be engaging. I am not one of those presenters. I believe an element of spontaneity and risk is fundamental to success for me. I presented at fundraising software user forum 2 years ago. I decided that I wasn’t going to do a formal presentation. I would ask the audience to all get up and make them part of my presentation. They looked terrified. It wasn’t my finest performance. Relying on an audience to ‘give you back’ what you need to drive your presentation is risky. It’s also – I believe – one of the most engaging things you can do. People are far more likely to feel ‘connected’ to your presentation, if you give them avenues to be a part of it. Just have an escape plan if it starts to look like a turkey! And there, are my 7 steps to ensuring your presentations are engaging. Miss Milly – the woman who could sell spats to snakes – is leaving. Miss Milly is a very talented fundraiser who values having a data monkey around, if only to laugh at the data monkey’s quirks! Reflecting on my time working with her, I realise that she is a rare breed indeed – a colleague you can have an argument with and still be friends at the end of it! In honour of her departure (somehow that wording seems oh so wrong! ), I’m re-posting my original description of her below. I will miss you Milly! I have a colleague who could sell spats to snakes. I once had a boss who was similar. A mate said of her ‘she could say you had two months to live and somehow you’d think that was good news’. Indeed when I think of former boss and current colleague – who I’ll call Miss Milly – they both had a similar way of smiling at the very moment you wanted to scream at them. They repeatedly have that ‘surely that can’t be too hard’ expression? It’s Miss Milly who convinced me that it was ok to implement a new fundraising database (aka big bird) AND within a few weeks kick off an acquisition campaign, a supporter survey, a few random eDMs and a step up in the community fundraising activity. I have no idea how she managed to hoodwink me into this one but as I say, Miss Milly could convince you to put a screen door on a submarine. To be fair, Big Bird is weathering the storm quite well. He’s only 3 weeks old and we are certainly making him run. I can tell I’m in for a chaotic couple of weeks. I already am telling myself ‘when I get through these few weeks I’ll have time to sit-down and learn how to use our new database better.’ I am of course delusional because when I get to the end of these few weeks, there will be Miss Milly and her smile and two words… Christmas Campaign. Does this sound at all familiar? You go to work conference: fundraising, Listening and Spoken Language, Disability, Microbiology… (doesn’t matter what field!) and you come home with copious notes and ideas – FROGS. You arrive home – probably exhausted – but also full of enthusiasm. And then you have to go back to work. In my case I’ve just spent a few days in Los Angeles at the A G Bell Listening and Language Symposium with some incredible inspiring and knowledge Auditory Verbal Therapists. However, I remember returning from fundraising conferences with a similar amount of head buzzing ideas and notes – usually paper; but in more recent times now electronic. And here are all these little frogs which could be destined to become princes, and what happens to them? NOTHING. Well, I’m not leaving without a prince this time. I’m determined to pucker up and kiss some frogs and get me some princes! In the spirit of Brian Tracy’s book Eat That Frog, I am going to achieve something. (If nothing else I will achieve callouses on my fingertips from writing out my mantra – kiss a frog!) But where do I start? Well, I’m going to start by lowering my expectations. There are only so many times I can kiss frogs before I’m going to have sore lips, too many princes than I can truly handle and perhaps a reputation for being the office tramp. Pick 3 things I’m going to make happen / change as a result. I thought about the last one long and hard. 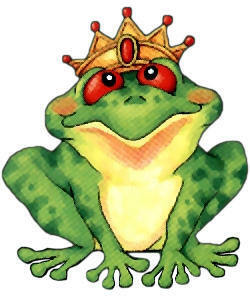 What 3 frogs would I pick to turn into princes – there are so many. Then I realised that while I so want to turn the embedded coaching frog into a prince, this isn’t my frog to kiss. I’m a data monkey. I can pass on that frog and the clinical guys can kiss him if they want. So instead of 3, I’m picking 1. The data one. A big one. LENA. We have such a rich data resource at our fingertips and we haven’t kissed him. We haven’t even got past the first date! So I warn you. Look out LENA. It’s time you became a prince. I can start now. It may take me ’til Christmas to give you a crown, but I’m going to do it. What frog will you kiss? This data monkey is finally back home in Australia following the A G Bell Listening and Spoken Language Symposium 2013. What a week – inspiring, exhausting, uplifting, eye-opening, mind-boggling and exciting. I’m not sure how many data monkeys over the years have been to a Listening and Language Symposium – I get the impression very few. It’s probably not what naturally leaps to mind. Listening and Spoken Language Symposium? Oh, yes, we’ll send the data monkey. I almost didn’t make it as at first our abstract wasn’t selected – maybe someone had told them that I did things like bring purple bunny rabbits and possums to presentations. Thankfully (for me), someone pulled out and we were offered a place on the agenda. I am sure that there are many people either enjoying a few extra days in the states right now, or heading home with a wealth of information, excitement and jetlag. What I’ve taken home is probably different to most because, quite frankly, what I brought was different to most. I don’t have the clinician’s lens, I just have my very visual but data driven brain. Embedded Coaching is not just a buzz word for guiding parents. To a data person, words like ’embedded coaching’ can spark off that extremely cynical part of their brain which says – ALERT, MARKETING AT PLAY! Thankfully, my cynical radar remained packed away as I learnt from Betsy Moog Brooks, that there are clear, definable steps and actions and – I believe – measurable skills and outcomes. Betsy outlined the Moog Center’s approach to embedded coaching so clearly and with great passion. She said she was nervous people paid $85 extra to see her presentation – it was well worth the $85. It’s sometimes a little hard for a data person to promote clinical change, but since it was the data person they sent – and specifically one who can be like a dog with a bone – I’m thinking that embedding coaching will be well and truly on our radar. To be honest, I’m actually looking forward to some of the data challenges that may come with that! (Sick, I know). I had a delectable experience finding out how I could go beyond the pre-loaded LENA reports and look at the raw data, export and link back to my database. Translated, that’s like – have your cake and eat it too! It’s been such a big week that this blog post doesn’t seem to do it justice, but this is all I have… along with a bit of jetlag and a possum who has returned home safely and will be reunited with his loving Listening and Spoken Language Specialist before the week is out! There are many things that one could associated with the term “top notch”. Restaurant comes to mind. Or service. The quality of donor notes in your database is probably not one of them. But JEFF SCHREIFELS AND RICHARD PERRY of the Veritus Group think they should be. Quality notes are listed as one of their 7 absolutes for major gift fundraising success. This got me thinking… what makes a note ‘top-notch’? What should you be recording in your donor database? Now, some of these will seem obvious but sometimes some of the simplest details are easy to overlook. Here is my list of things that at some point in my career I’ve found myself wishing someone had recorded! The donor’s first name. Yes, I warned you that I was going to state the bleeding obvious! Believe it or not, I’ve seen this scenario a couple of times. Major Donor Officer visits donor. Returns to office. Writes down notes about his/her chat with the lovely Mrs Johnston, lists the name of all her grandchildren and even the dog but at the end of it her record still says “Mrs C Johnston”. I understand that not everyone likes using their first name but it is a very valuable piece of information when it comes to major donor research; particularly if the donor has a very common surname. To give the major donor officers the benefit of the doubt, they may not have actually known the name, which brings me to item 2. Preferred way of being addressed. If a donor says “call me Betty”, it’s something to note. I’m sure that many major gift officers have a fantastic memory for names but in the event that person leaves the Organisation, that most fundamental of information is lost if it is not recorded. Location of the meeting. I’m reading a note someone wrote about a donor meeting 18 months ago – why do I care where they met? If that meeting was at the Organisation’s facilities, then we are going to avoid that embarassing situation of asking whether a donor would like to come on a tour, only for them to tell you they did that last year! Duration of meeting. This isn’t about clockwatching. While longer is not always better, I think recording duration can give you a hint to how comfortable, engaged or interested the donor is in the Organisation. I do stress the word ‘hint’. In my mind, I’m confident that a donor who has a discussion which lasts an hour is very likely to be more engaged that one who has a 5 minute conversation at the front door. I certainly wouldn’t go as far as saying that 1 hour conversation is better than a half an hour one. Some people can talk for a long time about not very much! Connection to Organisation. Most major donor officers are pretty good at recording this one – why did the person first start giving? What is their connection to the Organisation? Other connections and Relationships. Like the reason for giving, most people record when a donor mentions they went to school with someone connected with your Organisation – in a note. Don’t get me wrong, writing a note is certainly better than doing nothing. However, I’d encourage you to go one step further and put a big smile on your data monkey’s dial – link those contacts in your database. Data monkeys love links as these are so much easier to find and use than some text notes. I’m curious – what would do you think makes a top-notch donor note? This particular day, this particular monkey, is not in a particularly good mood. I can’t help myself. So what do you mean when you say younger? As a data monkey, I answer questions with data. The problem is in most organisation’s I’ve ever worked in at best, there has been reliable age or date of birth data for about 1 in 4 donors. I answer in my usual style. ‘About 50% of donors are aged over [insert number here usually between 75 and 80]’. The 20 something looks at you unconvinced. I imagine them having a conversation tomorrow on the bus (because we all know that all irritating conversations occur on public transport)… “and this woman was like, saying this stuff like, young people aren’t the best donors, and like, she didn’t even say like every second word.” (Yes, I know this makes me look incredibly old but I assure you that I’ve just been exposed to an excess of teenagers on transport of late who have two words they use to excess. One is ‘like’. The other starts with f. I’ll let you figure out the latter). If you are as tired as I of people looking at you as if you are a moron when you assure them that the majority of donors are over 65, then try this exercise. Go to your database and select the 20 most common names. Then go to a site such as “Behind the Name” and do a percentage based popularity search (I used United States). If the bulk of those top 20 donor names are born after 1970 or 1980, I’ll eat my data monkey hat! Dorothy: If your donors are called Dorothy, then chances are they were born well and truly before 1950. Why have I chosen Dorothy as an example? It’s nothing to do with my employer’s database (although it wouldn’t surprise me if we did have more than our fair share of people called Dorothy). The answer is it was my grandmother’s name (born 1913), and also my aunt (born in the early 1940s). 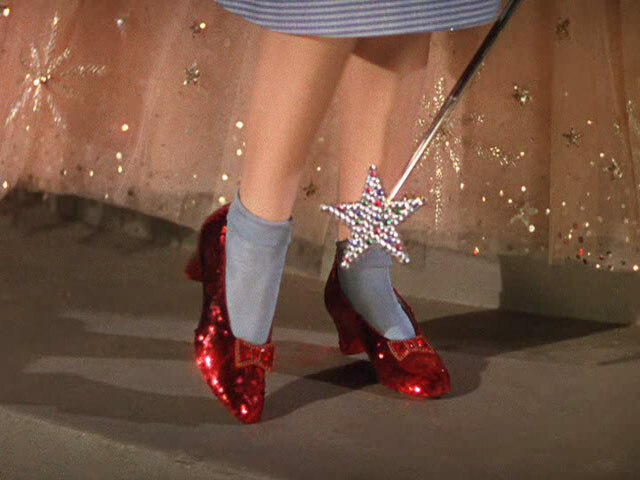 What Behind The Name did show me was that Dorothy actually reached it’s popularity height back in the 1920s and to my surprise doesn’t seem to have an over the rainbow ruby-slippered inspired resurgence in 1939. (The popularity it seems was reserved for the name of the star rather than the character, with Judy and Judith being very popular during the early 1940s. Similarly, the name Shirley surged in popularity in the early 1930s, I presume as a result of a chunderous little 3 year old movie star with ringlets). The E’s: There are a bunch of E names which just scream early 20th century. Ethel ranks among the earliest and I suspect the days of Ethel being in your top 20 donor names went out a couple of decades ago. (Hmm… this has me wondering when Ethel Merman was most popular… I can see a film and theatre trend emerging here) Esther, Enid, Elsie, Edna and Ernest are all probably in your database but no longer the main names. Beverley was popular through the 1930s and 40s, as was Donald, Joyce, June and Joan. Anyone called Helen is most likely pre-1940, as is Grace…. or they are still a minor as it appears to have made a comeback in the 21st century. Margaret was around for decades, steadily declining from about 1950 onwards. Marjorie, Marjory, Margery and any other variants thereof, were popular in the 1920s and 30s. Marilyn on the other hand, was a little later… I wonder what impact the movie star had on that one! Of course, there will be names in your top 20 which are timeless. I expect you’ll find John, William, Mary and Elizabeth (and all the variations thereof). If you’re running a regular giving program, perhaps Karen, Sharon, Janet, Mark, Adam, David, Christopher, Daniel, Brett, Kirsten or Laura will be more common? What are your top 20 donor names? PS: For those interested you can access the most popular names of recent times at the NSW Births, Deaths and Marriages website. It seems that Ruby has made a resurgence! Recently we had a staff day including an afternoon of professional development and ‘team building.’ Gulp. Are there another two words in the English language that can bring such dread to an introvert? For me, it’s a double whammy. Not only do I not enjoy being in a room for 40 other people (4 is about my limit), but I have such a high degree of cynicism when it comes to team building that I find myself coming up with various schemes which may get me out of this exercise. As for networking, I’d rather poke myself in the eye with a stick. Thankfully, the facilitator of the session – the value of networking – was remarkably sensible. Sandra Wood ran the session. The timing was perfect as there was a supporters event the following week. When asked about how I felt about networking, I freely admitted that the idea made me feel rather ill yet I also knew there was no way of escaping the function I had to attend. Sandra’s advice was practical. Eat before you go. Hold your drink in your left hand and keep your right hand free for shaking hands. And my favourite – if you need to join a group, go for a group of 3 not 2. Her practicality won me over. Here was a woman who took the time to acknowledge that this is something many people do not want to do; something people dread and then set about trying to ‘lessen’ the dread. Over the years, I’ve met many facilitators of professional development and in particular ‘team building’. Nearly all of them seem to have the opinion that introverts just need to become team players. Few acknowledge the challenges and for that I really do give Sandra credit. Through the workshop, Sandra tried to get us to re-interpret our thinking. I was sceptical to say the least. However by the end of the session, I had realised that given I had to go to this event, I might as well try to make it more bearable for myself. Could I feel comfortable in myself doing this – definitely not! Did I feel proud of the work my employer does – absolutely! That was my key which took off the edge. If I just focused on the positive feelings I have about my job, then that would negate any lack of confidence in a crowd. I’m pleased to say that I survived the function and even managed to have a couple of good conversations with a some major donors! For that I have to give credit to Sandra Wood Consulting. I certainly won’t be volunteering myself for such events in the future however when I do need to attend, I think I now have a few tricks to get me through them with better results. Do you ever wonder what you can tell about a person from the way they look? Recently, I’ve been assisting with some donor research for a major campaign. When gathering information, photographs invariably come into the mix. This got me wondering – what can you discern from the way your donor looks? If I were to take the advice of my mother, the answer would surely be ‘a good deal.’ I grew up listening to my mum during the evening news tell me all about people from the way they looked. ‘I don’t like that man; he has a nasty mouth.’ (I don’t really want to admit it but I tended to agree his mouth wasn’t born out of happy street). So I delved into my bookshelf and unearthed a copy of Snoop: what your stuff says about you. I acquired this book more than 2 years ago now. It seems that since then the author Sam Gosling has acquired a PhD and the book has been re-released with a new lime green finish. What does your desk reveal about your personality? What about the books you own or the pictures on your wall? And what’s the best way to find out what your new partner is really like? Would Snoop reveal to me the mystery of my messy desk? (I’m not sure whether it solved the mystery but Gosling himself admits to a mess of a desk and he seems to have some street cred when it comes to analytics so I’ll take that as proof that a messy desk does not spell the end of my analytical career). rate people’s personalities just from looking at photographs of them. Considering they have nothing more than a still photo to go on, our observers… were surprisingly accurate at judging others’ levels of extraversion, agreeableness, and openness. So it would seem if on viewing a photograph of a donor I see them as creative or unconventional, this can be a valid way of determining they are a person high in openness. My next line of thinking is whether we can do anything with that? I tend to think perhaps we can. He doesn’t say much about people with nasty mouths though. I must tell my mother that.